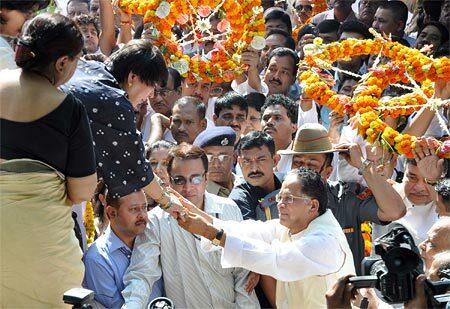 Thousands of mourners with tears in their eyes gathered at the airport here as the body of Assam's cultural icon Bhupen Hazarika was flown in from Mumbai today. Governor J B Patnaik and Chief Minister Tarun Gogoi received the body and paid floral tributes to the doyen, who passed away in the western metropolis on Saturday. 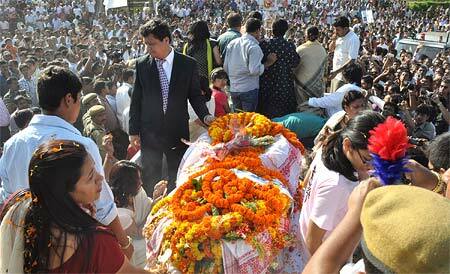 Sandip, Assam Culture Minister Pranati Phukan accompanied the maestro's body. 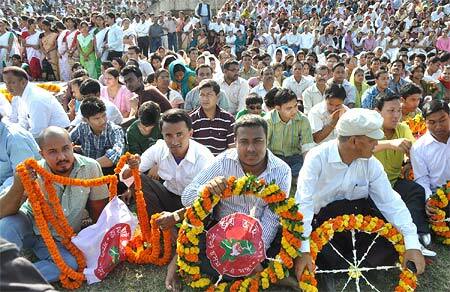 Hazarika's body was taken in a procession to his residence at Nizarapar area here. It will be kept for brief periods at Dharapur, Gauhati University, Maligaon, Bharalumukh, Dighalipukhuri in the city before being kept in state at the historic Judges Field to allow people to pay their tribute to the composer-singer, who had become legend in his lifetime. 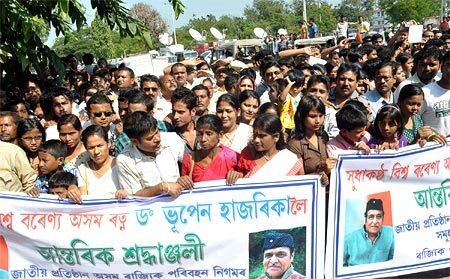 His only son Tez Bhupen Hazarika will arrive here tomorrow morning from New York to perform the last rites. Assam government has declared a state holiday tomorrow in honour of the Dadasaheb Phalke awardee. the balladeer loved and eulogised in many of his musical works, literary and cinematic creations.